The show opens to the public this Thursday, the same date as Danny Meyer's pop-up cafe, Sandwiched, opens at the museum. This temporary cafe will feature special sandwiches from the Union Square Hospitality Group's stable of chefs including: Carmen Quagliata (Union Square Cafe), Michael Anthony (Gramercy Tavern), Floyd Cardoz (Tabla), Daniel Humm (Eleven Madison Park), Kenny Callaghan (Blue Smoke), and Robb Garceau (Hudson Yards) and will serving hungry museum visitors during the renovation of the permanent dining space on the lower level. And that's not all the Whitney has up its sleeve for food. Tuesday night is the museum's VIP night, Wednesday night it's open to all members of the Whitney museum and their guests, and while Sandwiched won't yet be open, the museum will have several food trucks on hand. 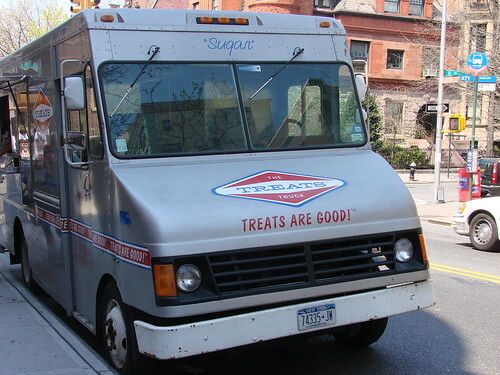 The Treats Truck will be making a repeat appearance--they were at the 2008 opening--and the nights will mark the debut of La Petite Temptation, Hoboken's (and Jersey's) first dessert truck. "The trucks are open to the public. The Whitney closes off the street to parking and the trucks are parked outside on 75th and Madison. The only other trucks invited out there are Treats Truck and Rickshaw doing savory food from 7pm - 11pm each night." I'll admit that I'm very intrigued by La Petite Temptation's $5 dessert menu. The four desserts previewed over at Chilltown Lunch look amazing.